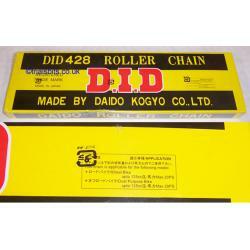 A Japanese made DID standard 428 (1/2 X 5/16) chain suitable for up to 20PS. Supplied with 134 links, which should be long enough for just about any application. A split link is included. Please look in our tools section for chaincutters if you need one. I would recommend this chain for the BSA C15 and B40, as some of the heavy duty chains are slightly wider and can foul the engine cases.